Oh I just love the idea of a Mexican barbecue party. Thinking about margaritas, burritos and bunting make me want to put a flower (or even better, TanyaMac's happy hairband!) in my hair and dance around! Anyone know a good Mariachi band? 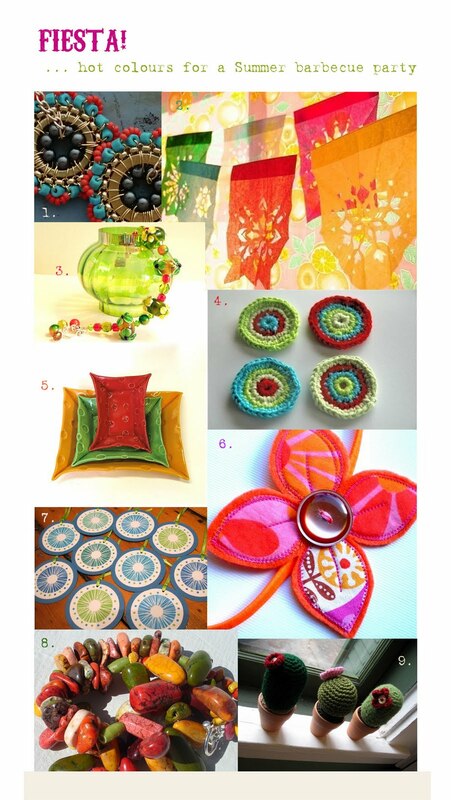 These are some of my favourite Etsy picks on the Mexican fiesta theme. Aren't those crochet cacti by acrudele the cutest things ever?! I'd love these for my sun room. We put up some bunting like aymujer's in there last week, and it feels so bright and festive. I think propeller's cheery little gift tags would be gorgeous on party favours, or even strung together as a garland. Now all we need is a sunny day!